It’s been a fantastic summer here in Vancouver, but with a big price to pay. Drought, wildfires, plant life stressed from the endless sun and heat. None of us have been used to it in this region. It’s made camping easy – no rain gear to worry about – and choosing to jump on the bike very easy, except for when it got too hot. But I’m very, very happy to see the rain; to bundle up in a little extra clothing and to smell the rain dampened air. 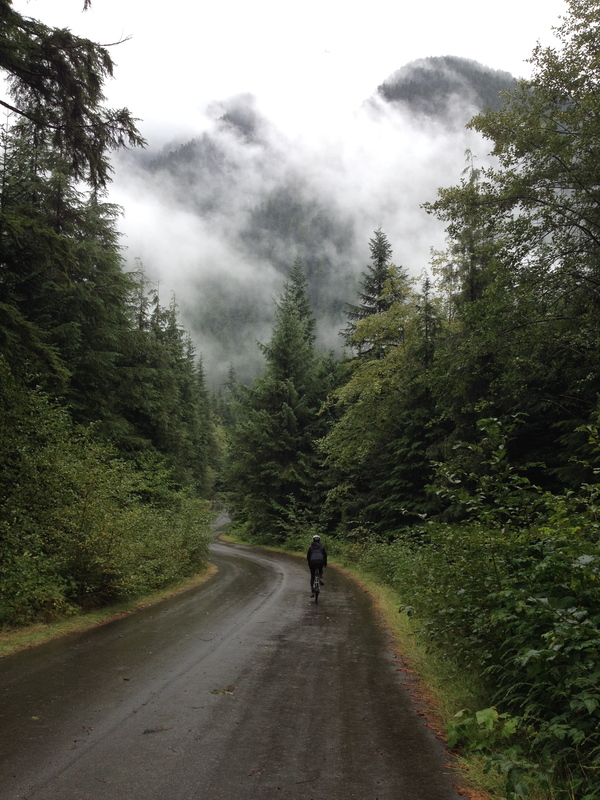 A quick and easy ride to access from the city is Rice Lake Road up at the Lower Seymour Conservation Reserve. On a drizzly Tuesday last week it was almost devoid of human life, a few branches scattered around from the wild windstorm that had swept in over the area during the week-end (the LSCR had dodged most of that bullet). 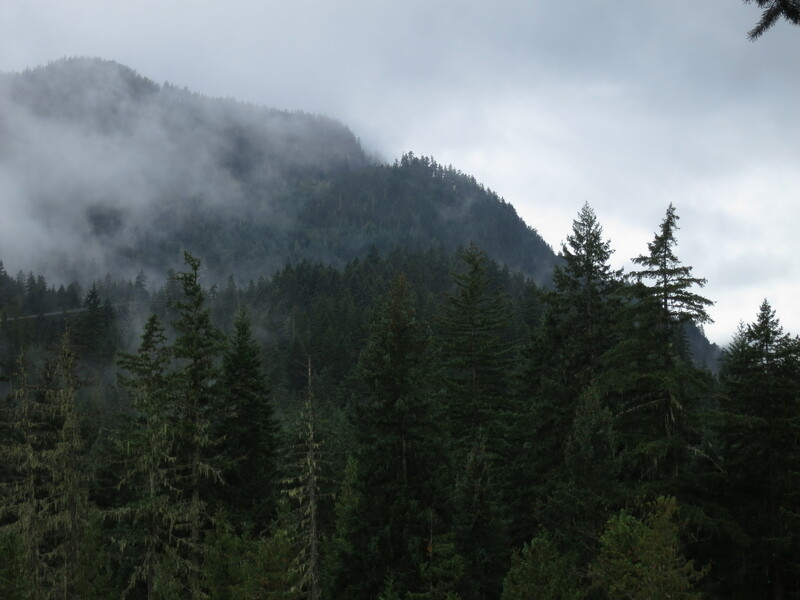 It was a typically cloudy and misty day à la BC. 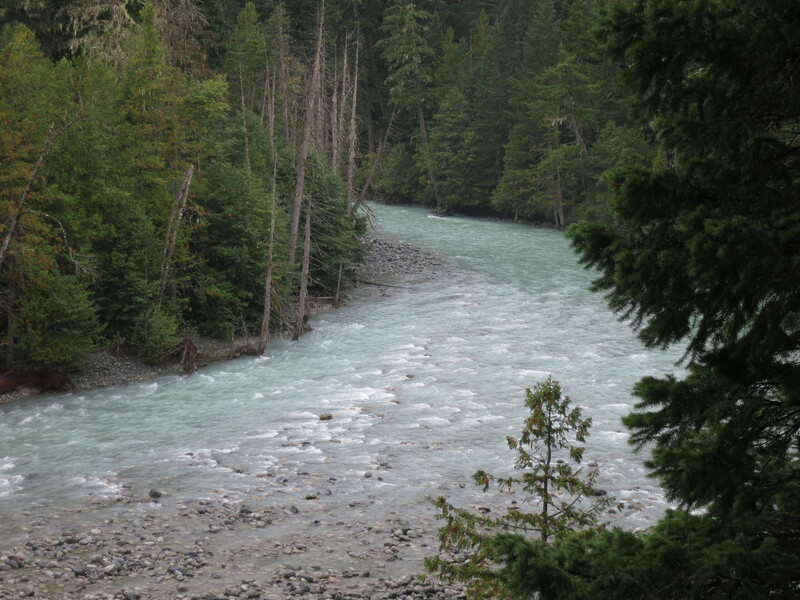 Nairn Falls Provincial Park is a great campground just off the main road between Whistler and Pemberton. One night was all that was needed. A campfire allowed again after a long ban and a prime view over Green River (we didn’t walk to the Falls, too busy struggling to put up a tarp in the wind. In the end the wind won, the tarp ripped right down the middle. We just put up the tent and hoped it would keep the rain out, which it did). Damp, mulchy foresty goodness. We were sitting having a glass of wine when a chipmunk ran up with a pine cone the same size as him. I guess his view was obscured by the cone and he hadn’t seen us. Skidding to a halt he did a quick duck off to the side and ran behind a tree. We heard mad chattering early the next morning outside the tent so perhaps he was still a bit peeved at us….